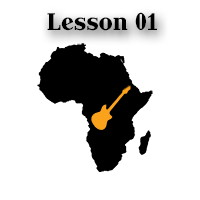 African polyrhythmic guitar lesson with downloadable TAB. Polyrhythm is a key element to African music. This is a 2 over 3 example, played fingerstyle. The thumb of the picking hand keeps a steady rhythm while the other fingers are playing the melody. The fretting hand holds simple chord shapes. Make sure that you pick the melody line with your fingers slightly stronger than the bass line. Playing the piece this way, the melody will come out louder, on top of the alternating bass notes played by the thumb. Try to fret the barre chords lightly on the neck, so your chord changes can be accurate, and the notes remain in tune. After recognizing the two patterns separately, it’s helpful if you try to hear the rhythm of tune as a whole. 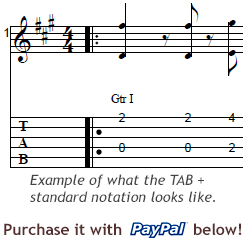 The actual – still rather easy – rhythmic pattern will be revealed this way. Once you memorize it – with both your ears and your fingers – you will be able to use this pattern to create your own musical pieces. It’s a simple fingerstyle figure that’s quite overlooked and not being used all that frequently. Knowing it comes handy in both rhythm guitar and solo guitar playing situations. Even if you are part of a band, you will be able to inject an interesting sound in your arrangements. ← Previous Previous post: Guitar 10ths – how to play them?